Overdressed Underprepared: Which Watch Would You Want? Which Watch Would You Want? I have to admit that I'm not even a huge fan of the big watch companies such as Tag Heuer and Rolex. Don't get me wrong, both companies have their beautiful watches, but I bet I could find something more stylish and for a hell of a lot less (and when I say a hell of a lot, I'm talking thousands of pounds less). This isn't easy for me either, I'm incredibly fussy about watches. A watch is like a great pair of shoes, pick right and it could last you years. Genuinely though, what's the point in spending thousands of pounds on a watch that isn't going to add anything to your outfit or style? A watch should be an extension of your personality, not an extension of your wallet. This is definitely one of the most simple designs that Komono does, but I thought I'd start with something simple. I have a Komono watch (shown here) and I love it, I wear it all day, every day and it's still ticking along beside me. It's the longest lasting watch I've ever had and the moment I decide to replace it, I will go back to Komono. They're stylish (Even Urban Outfitters stock them now), well made and well priced. Simple as that. I've always had a thing for Nixon watches, but that's partially due to the temptation of having my own surname on my watch. However, they do make beautiful timepieces, once you go over the £100 marker anyway. If you want to pay less, you'll end up with a rubber (yet still mildly alluring) version of a man's watch. I'm sorry to those of you who do have plastic or rubber novelty watches (including my housemate that loves his rainbow coloured, plastic monstrosity Swatch), but they are reserved for children... and extreme sportsman. Not you. This is a stunning watch and I'm genuinely in love with it. You will genuinely struggle to find anything more stylish than a Komono watch for the price they ask. 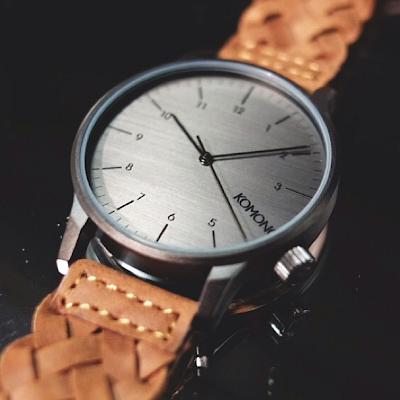 The brushed chrome dial with the woven leather strap genuinely make this watch irresistible to me. Unfortunately, it hasn't been released yet and so I'm eagerly anticipating the price of it. I have never intended to own anything Armani in any way, some of the watches are nice I know... But when it comes to watches, stick to a company that does watches first, everything else later. Otherwise (and especially in the case of Armani) you are paying for the name on your wrist, not the quality beneath it. On the other hand, I actually love this watch. It's the denim strap... I love it. It's stylish but still classy. I'm in shock. Well done Armani. Triwa is a fantastic watch company in my eyes. They won't get into the sights of any horological aficionados, but for the regular man, they are awesome. I'm not normally a guy for the chronograph watch, knowing the time alone tends to work for me. However, these watches are beautiful, stylish and by the look of it, very well made. I have wanted a Triwa watch for far too long now... I may have to suggest it for my upcoming birthday. I'm not claiming to be any form of horological know-it-all, but I know what I like and what will look good. If the name of the watch company is normally found on a pair of boxers worn by arse-showing teenagers... Don't buy it.